Bill's Bayou: THIS IS A BLOG ENTRY! THIS IS A BLOG ENTRY! WHY ARE YOU IGNORING ME!! PEOPLE WHO WORK IN GYMS ARE AN ENERGETIC LOT!! THEY ARE EASILY EXCITABLE!!! IT DOESN'T TAKE MUCH TO GET THEM TO HELP YOU! THEY REALLY WANT YOU TO ENJOY YOUR WORKOUT!!! THE EXERCISE MACHINES HAVE HEADPHONE JACKS THAT LET YOU LISTEN TO THE TELEVISIONS!! AS YOU CAN SEE, IF YOU DON'T HAVE YOUR OWN, YOU CAN BUY THEM!!! BUY SOME HEADPHONES!!! I SAID "BUY SOME HEADPHONES!!!" WHY ARE YOU IGNORING ME!! 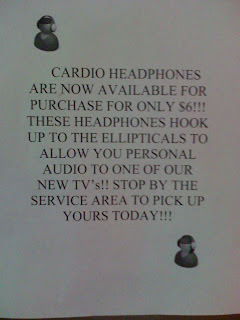 IF THE CLIPART PEOPLE DIDN'T ALREADY HAVE HEADPHONES ON THEIR HEADS, THIS NOTE WOULDN'T NEED TO BE SO LOUD!!! BUT THEN AGAIN, THEY'VE ALREADY GOT HEADPHONES!!! AND A SURPLUS OF EXCLAMATION MARKS TO SUPPLY ALL YOUR LOUD NOTE NEEDS!!! I laughed until my stomach hurt at "if the clip art people didn't already have headphones on..."